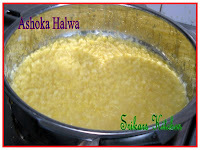 Take pressure pan or cooker add moong dhal, milk & 2 cups of water, allow upto 3 or 4 whisle. 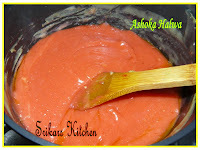 Mix well together ( using hand blender gives better results as you would get a fine paste). pre heat another pan, add moong dhal paste, allow to cook. Add sugar. After adding sugar the mixture will get little runny.Keep simmering. 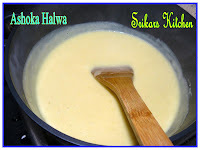 In a separate pan melt 2 tbsp of ghee & add in the wheat & plain flour to cook it until raw flavour extracts. 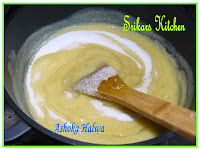 Add this flour mix to the simmering moong dhal mix once the sugar dissolves. Dissolve red colour in the mix. Fry some cashewnuts separately & keep separate for garnish. Start to add in the melted ghee slowly & mix throughly until you get a texture which doesnt stick to your hand or to the pan. Wow,nice step by step pictures...I too have this in my archive...yours have come out nice! 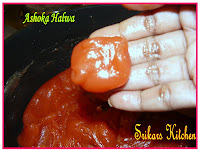 looks delicous..you have explained the process so well and Have been seeing this in many blogs..now my turn to try this yummy sweet.. This sounds so differnt. Never tried this before. Halwa looks so good. YUM! Have bookmarked this recipe. Will try it soon. The halwa looks great, priya Thanks for the easy instructions. Raks kichen, sowmya,divya, mahima , Raaji thxs for ur valuable comments. sukanya, priya, sireesha,rekha,vg, sia thxs for ur comments..
Wow vibrant color. Looks gr8. Never heard of this before. Lot of new recipes. 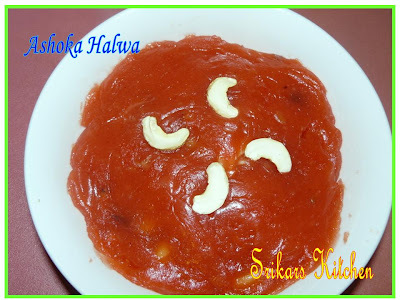 hi priya, halwa looks so yummy & i've been looking 4 a halwa recipe. will give urs a try soon. thanx. btw, wishing u & ur family a Happy Diwali. Lovely color to the halwa priya. 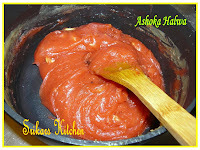 I am guessing Ashok halwa is same as Karachi halwa, is it? That looks wonderful, nice procedure pics. That colour and that shiny appearance - absolutely tempting. I made this for diwali last year & posted too. The halwa looks delicious. I have to try this! what a gorgeous color! looks so lovely! Happy diwali.. Ashoka looks so good... Yumm..
Sri check my blog for an award..Happy Diwali to u n ur family.. 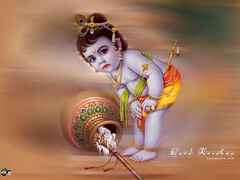 Happy Diwali to and ur family!!!!! New to me. In fact I have never heard of this halwa. Thanks.